We would like to welcome all of our members new and old back to Kent, we hope to see as many of you as possible at our upcoming events and weekly showings. A reminder that the weekly showings will always be free of charge and open to everyone not just those who have joined the society. Out of interest i'm just going to leave this blank and see if anybody notices. If you do please tell me. We are UKC’s Science-fiction, Fantasy and eXtreme cult society. We hold weekly screenings of movies and TV shows, chosen by our committee and voted for by you. The showings are every Tuesday in Eliot Lecture Theatre 2. Doors open at 6:30pm for social time, with the showings starting at 7pm. 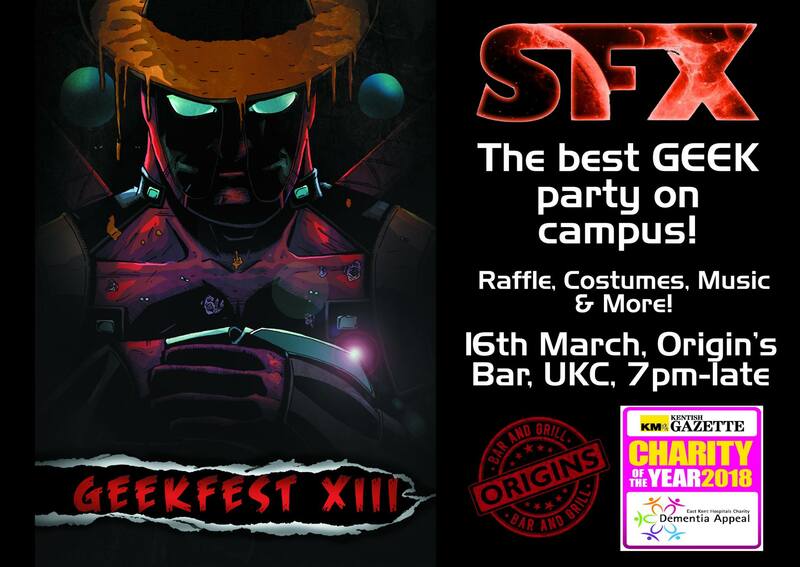 We also run marathons, quizzes, cinema trips and our annual charity event, Geekfest, which has themed music, a costume competition and a raffle of epic proportions! So there’s always something to do. Our £5 membership fee gets you discounts at Level Up Games and Marlowe Costumes in Canterbury.